It was a rare day on the Isle of North Uist – a winter afternoon that was neither wet nor windy, as is most common. The atmosphere was cold and clear, the sun was coming down, and the sky was a misty blue that melted into pink hues as it met with the horizon. The land which led up to the beach – low-lying grassland called “machair” – was completely white. 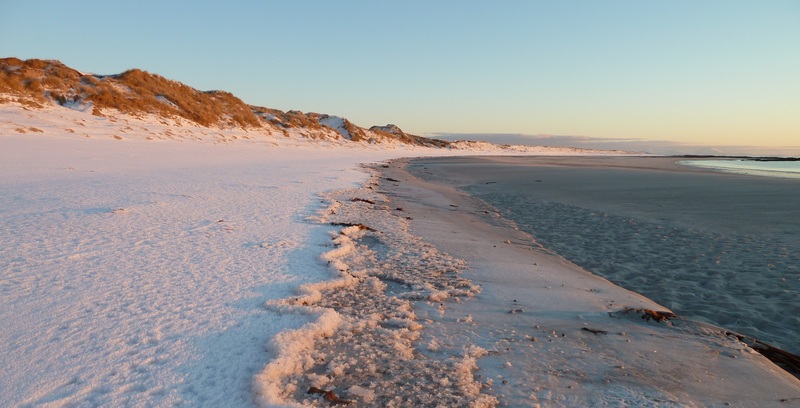 The usual sand dunes were snow-capped and the beach itself, both sides of which stretched off infinitely, was frosted until the ocean no longer allowed it to be. Some say photography is all about working for that “perfect” moment. Dedication, patience and resilience in the face of grey skies and poor lighting (a particular problem for Scottish photographers). These attributes are even more valued today, as ritualistic darkrooms, with their spools and chemicals, have been displaced by digital. Within the growing practice of in-game photography, these qualities also exist. In Assassin’s Creed: Origins, capturing the dusty orange-glow of a desert sandstorm requires a degree of patience, although the conditions are arguably easier to repeat when compared to the once in a life-time capturing of a frozen Hebridean beach. There are of course still angles and compositions, meaning some shots of Origins‘ sandstorms will always look a little better than others. On top of this, virtual worlds are becoming increasingly complex and offering more and more photographic variance. Walter Benjamin’s critical essay The Work of Art in the Age of Mechanical Reproduction contains several enlightening passages on photography and film applicable to in-game practice. Firstly, we can say that the majority of in-game photography is independent of the game developer’s own vision – screenshots do not just reproduce art, they are a creative process in and of themselves. Three dimensional cameras, and beyond this hacks and photographic tools like Ansel, mean that it is unlikely one photo will look like the next. Developer’s encourage this; unique angles and perspectives shedding light on the details the artists have painstakingly created. Camera tools like these can “bring out those aspects of the original that are unattainable to the naked eye”. What’s more, adjustable at will, the camera can blow-up and freeze-in-time what is often missed or skipped in motion. Benjamin describes the process as capturing that “which escapes natural vision”. You might shoot a virtual landscape in order to study the contours of the pyramids and mountains, or snap a close-up to distill a particular animation or expression. One approach for in-game photographers is to isolate and make analysable “things which heretofore had floated along unnoticed in the broad stream of consciousness”. The act of playing is an unfiltered “stream”, whilst photography is the isolation of specific things for effect. Games offer what Benjamin called an “optical spectrum”, a space of possibility where photography can deepen our perception. Other metaphors Benjamin used to describe the act of photography were “tester”, “critic” and “surgeon”. As opposed to fine art where there is a distance between the artist and the subject, photography involves a break down or intrusion of this space – prodding, poking and cutting into the subject. Video games simulate this relation; the designers create at a distance like magicians or painters, whilst photographers create with the invasive, prying curiosity of the surgeon, pressing themselves up against the very limits of virtual worlds, hacking, modifying and no-clipping their way into the subject.